Can Stephen Jay Gould’s theory explain why there were no batting Triple Crowns in MLB for 45 years? This article originally appeared in SABR's "The 1967 Impossible Dream Red Sox: Pandemonium on the Field" (SABR, 2017), edited by Bill Nowlin and Dan Desrochers. Gould begins by arguing an observable improvement in hitting, pitching, and fielding skills in Major League Baseball. Most people would agree that players are faster and stronger today than those of past decades, mainly due to better training methods, nutrition, lifestyles, and equipment. There has also been an expansion of the available talent pool. The American population has significantly increased and teams actively scout and sign more players internationally than ever before. So, if there has been an improvement in baseball skills since the 1940s, what has caused the disappearance of the .400 hitter (and, by extension, only one Triple Crown) since 1967? Even though the improvement of talent and skills may seem self-evident, perhaps there has been greater improvement in pitching and fielding skills than there has in hitting skills. Have league-wide batting averages actually declined since 1941, indicating better defense relative to offense? This question is testable, and Gould explains data that actually shows there has been no drop-off in league batting average since 1941. It has essentially hovered around .260. Note that this .260 value has not been precise; there have been fluctuations. In the pitcher’s era of the 1960s, league batting averages were lower than .260, likely due to the height of the pitcher’s mound and larger strike zone. Batting averages have been slightly higher since the mid-1990s, the start of the current power era. Overall, though, in the larger picture it is safe to conclude, as Gould does, that even with the different eras of baseball, batting averages have been fairly consistent. Therefore, it is difficult to conclude that there has been a decline in batting average performance since 1941. In any event, the Triple Crown is a relative phenomenon. Should hitting skills decline (or increase) across the board, one hitter could still lead in all three diminished categories. Gould then supposes that the decline in batting average peak (the .400 hitter, the outlier) is due to decreased variation in the population of hitters. In other words, as the skills of both hitters and pitchers improved, and as the pool of talented players to choose from increased, the variation in talent (the difference between the best to the worst batting averages) should decrease. Therefore, players in Major League Baseball in more recent period are arguably reaching the “wall” of human performance. Gould’s analysis of the data supports this idea, as the standard deviation of league-wide batting averages has decreased steadily since the early 20th century. Gould concludes that the .400 hitter has disappeared mainly due to decreased variability in the talent pool. Since his ideas have been published, other baseball analysts have considered Gould’s work and have generally supported his conclusions. But Triple Crown Awards are of interest here. Can Gould’s analysis and conclusions be applied to the low number of Triple Crowns since 1967? First we should note the obvious: the .400 hitter is a “benchmark” offensive rate statistic that in recent times represents an extreme outlier among the pool of MLB talent. The Triple Crown indicates a best in league performance in three categories. These skills are different and a Triple Crown winner must own them all. Two of these categories measure intrinsic skills of the batter. Home runs are a measure of power skill, whereas batting average measures a skill dependent on strike zone judgment, pitch discernment, and hand-eye coordination. In addition, two categories of the Triple Crown statistics are dependent on external factors: playing time (to accumulate sufficient HRs and RBIs to lead all other batters), order position (RBIs), and team on-base ability (RBIs). Therefore a Triple Crown winner must be an extremely skilled batter with players who get on base in front of him in the batting order. A Triple Crown measures something different than the .400 hitter. Since the Triple Crown is a best-in-league performance in these three categories, its rarity since in 1967 is either a statistical fluke or has been caused by something that has changed in baseball since the 1960s. If we accept Gould’s hypothesis that a decrease in league-wide variation has led to a decrease in the probability of having an outlier, can we apply that to the rarity of the Triple Crown since 1967? In other words, has the probability of leading a Triple Crown category in any given year decreased since the 1960s? The overall hitting talent has probably increased since the 1960s; players are better trained and are selected from a growing pool of talented players. One might expect a decreased variation in hitting talent as major league hitters are reaching the posited “wall” of batting performance. Because of the combination of talent increase and variation decrease, it follows that the probability of leading the league in the Triple Crown categories decreases. A simple analogy might help: it is harder to stand out in a crowd when the crowd is bigger and more talented. This increased “clustering” around the mean has been demonstrated to be the case in batting average. Dan Fox, now of the Pittsburgh Pirates, writing for Baseball Prospectus showed that the percentage of players who have batting averages greater than 2.5 standard deviations from league average has decreased since the 1960s.2 From the 1900s to the 1950s, about 17% of players were at least 2.5 standard deviations above the average league batting average, in the 1990s, it was 9.7%. Underlying skills are another factor. There are quite different batting skills required for the Triple Crown categories, namely power, batting “eye,” strike zone judgment, pitch discernment, and hand-eye coordination. As player talent increases, it follows that variation in batting skills also decreases. Therefore, the chances are less that any one player could be the best in league in many different skills in one year (i.e., what would be required for a Triple Crown). What about the pitching Triple Crown, defined as leading the league in earned run average (ERA), wins, and strikeouts? Looking at the same time frame as used at the start of this essay, there have been 10 winners of the pitching Triple Crown since 1967 and seven winners in the 34 preceding years—something obviously different has happened with batters and pitchers since 1967.3 As with batters, training methods and the increasing pool of pitchers to choose from have most likely improved the skills and performance of pitchers. Has this improvement in pitching skills led to another decrease in variation, another clustering of performance? If so, the pitching Triple Crown does not reflect this “clustering” as it seems to in the case of the batting Triple Crown. So what could explain the difference between the pitching and batting Triple Crown? The skills needed to lead the league in strikeouts include superior skills and playing time, something mostly under the control of the pitcher himself. The other measures of the pitching Triple Crown require less of personal pitching skills. ERA is certainly a reflection of skilled pitching, but is also dependent on fielding and park effects, especially home park effects. Wins as a measure of pitching performance are even less dependent on pitching skills—they are quite dependent on offensive run support. Since the winner of the pitching Triple Crown requires more of the players around him (offense and fielding helping ERA and wins) than the batting Triple Crown (players in scoring position while at bat helping RBI), it is might be that even though the pitching Triple Crown represents a great season, it may be easier to obtain than the many skills required for a batting Triple Crown. So it seems as if there may be an explanation for the recent rarity of the batting Triple Crown, and Stephen Jay Gould’s baseball research may have provided some insight. Before the expansion of talent in baseball, before the decreased variation in skills and performance, it was easier to stand out in the crowd, easier to win the batting Triple Crown. It took an exceptional year by a multi-skilled individual, placed in the right situation, to do it again, namely the great season by Miguel Cabrera of the Detroit Tigers in 2012. ANDY ANDRES is a diehard Red Sox fan who lives in Cambridge, Massachusetts, with his wife, Kate, and their three children, Maddie, Aubree, and Griffin. When not spending time coaching and playing softball, he teaches biology at Boston University and Harvard College. He plays P/3B for The Jumbo’s Peanut Surprise in various Tufts Softball Leagues, and has been schooled at Universities Brown, Harvard, and Tufts. He teaches what is likely the first ever college course in Baseball Analysis and Sabermetrics at Tufts University with David Tybor and Morgan Melchiorre. 1 Stephen Jay Gould. Full House: The Spread Of Excellence From Plato To Darwin (New York: Harmony Books, 1996). 3 See http://www.baseball-reference.com/awards/triple_crowns.shtml for a list of batting and pitching Triple Crowns). Get your FREE copy of our e-book (or 50% off the paperback) on the 1967 Red Sox. 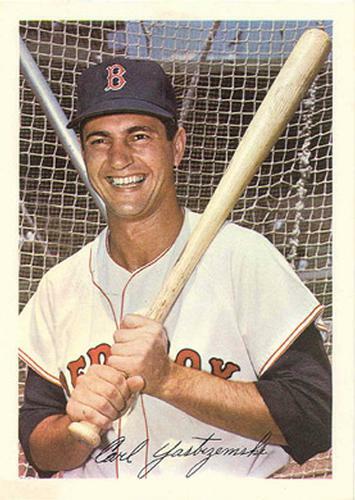 Click here to read all SABR bios from the 1967 Boston Red Sox team.